People detour from the N9 – the national road to Graaff-Reinet and travel to the quaint little hamlet that is Nieu Bethesda, it’s a town filled with little shops, accommodation, and restaurants as well as the treasure that is the Owl House. 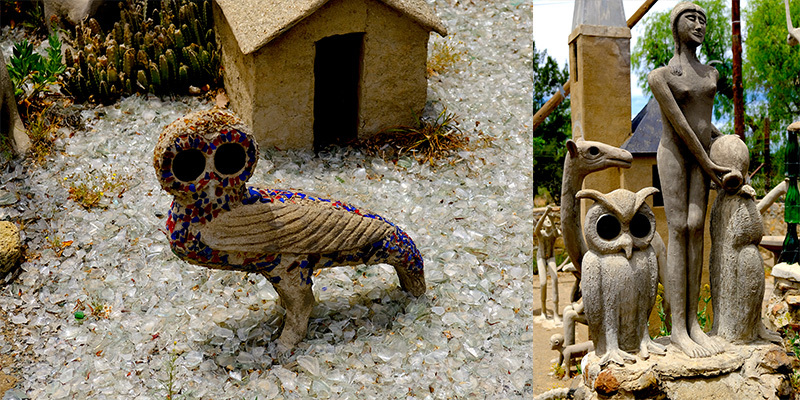 We specifically stayed a few days to see the Owl House and surrounding attractions. It looks like any other house until you spot the arch that leads one to the camel yard and the many delights it holds. 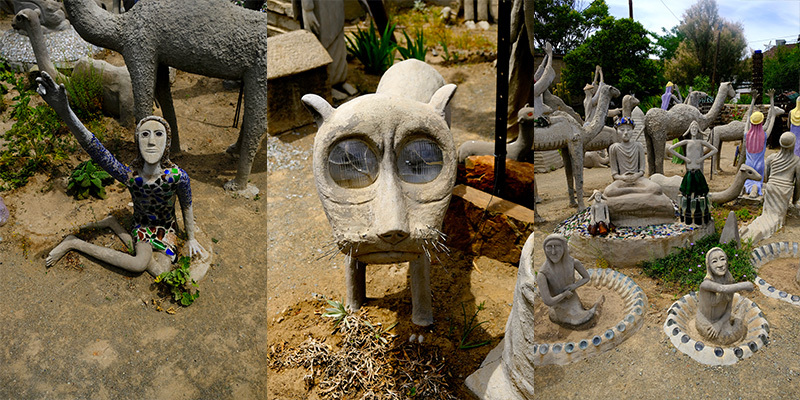 The Owl House was created by Helen Martins, who out of despair tried to change her life by introducing colour, texture, and shape. She was a quiet, reclusive figure who rarely ventured out into the town but rather devoted time to the magic that she created. She was born in Nieu Bethesda and was the youngest of 6 children. Schooled in Graaff-Reinet she graduated with a teaching diploma. After a failed marriage she returned to Nieu Bethesda where she settled in the property that is now world famous. She was known to all as Miss Helen, a retiring figure who employed local labour to help her construct the Camel Yard. 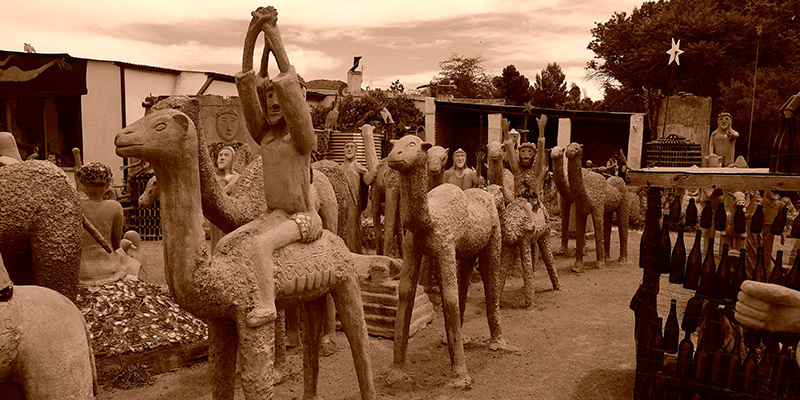 Koos Malgas was the most famous labourer who worked with Miss Helen to perfect the techniques used to develop the sculptures that make up the Camel Yard, which is filled with its many sculptures of bottle-skirted hostesses, mermaids, camels, and pilgrims, all on a pilgrimage to a mystical east. 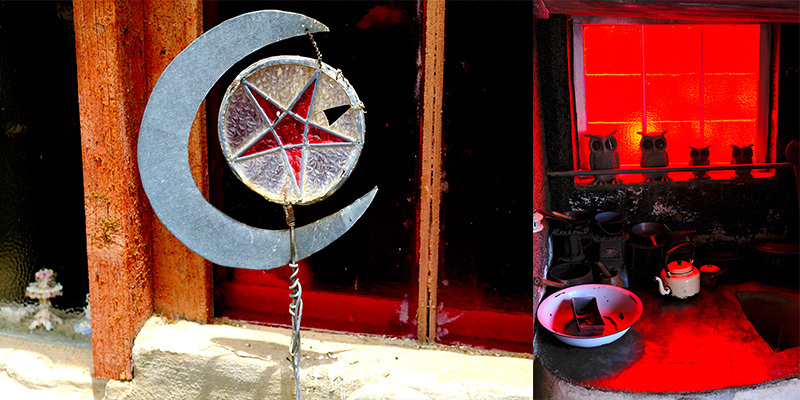 Her imagination transformed humble materials such as cement, glass, mirrors, and wire into a secret, magical world that she shared with few, drawing upon Bible stories, the Rubaiyat of Omar Khayyam, the Orient, and everyday objects – all of which blended to create her own personal cosmology. The Owl House has touched many lives while Miss Helen lived and even after her passing the playwright Athol Fugard wrote a theatre script “ The Road to Mecca” which was later made into a film. Over a 12 year period, Miss Helen created hundreds of sculptures painted the interior of the house in bright colours which were then overlaid with crushed glass. The bright colours and light resonated with her and the house came alight at night when candles and lamps reflected off the many mirrors in the house. At 78, crippled by arthritis and suffering an increased loss of vision – the latter possibly caused through her working with ground glass – Helen took her own life by drinking a mixture containing caustic soda. Today, the Owl House Foundation is the custodian of Miss Helen’s vision, and it is through the foundation’s efforts that the magic of the Owl House can touch many more lives. The Owl House’s operating hours are 09h00 to 16h45, Monday to Sunday; December school holidays, 08h00 to 17h45; and closed on December 25. Tickets may be purchased at the visitors’ centre entrance in Martin Street and cost R60 for the Owl House only, and R90 for a combined ticket to both the Owl House and Kitching Fossil Centre. The Fossil Centre is diagonally across from the Owl House and is well worth a visit, included in the visit is a guided tour of the river bed nearby where you can actually see fossils in the rock layer.